There are several common types of skin cancer and a number of less common ones. 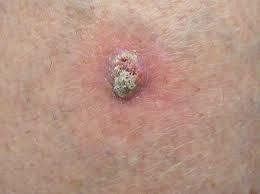 The most common two types in Australia are Basal Cell Carcinoma (BCC) and Squamous Cell Carcinoma (SCC). These skin cancers are commonly related to the amount of sun exposure a person has had throughout their life but can be related to cigarette smoking and other chemical factors and in come cases can have a genetic cause. Those with fairer skin and hair are more likely to get BCC or SCC but they can occur in anybody. Both BCC and SCC start as pinkish often scaly blotches on the skin. They may be associated with itching or burning sensations. 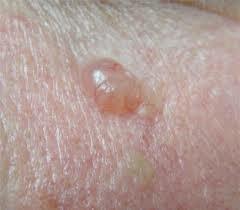 If left untreated they can progress to ulceration creating open wounds or large masses. In the more advanced stages SCC can travel around the body and affect other areas so it is important that early treatment is performed before it gets to that point. When they are identified in the early phases (before they begin to invade) there are several treatments that do not involve surgery. These include laser therapy, and several different anti cancer creams. Once a skin cancer begins invading the success rates of these more superficial treatments decreases and surgery becomes the recommended treatment. The particular treatment required will depend on how invasive or advanced your skin cancer is, where it is on your body and how large it is. In certain areas it is possible to remove and directly stitch up the area as the sole treatment. In other areas if may be necessary to perform skin grafting or skin flaps or a combination of these. At your appointment your surgeon will discuss your skin cancer with you and outline the various options and recommendations for treatment. For each cancer there may be several options and the risks and benefits of each treatment will be discussed with you. Based on the particulars of your skin cancer your surgeon will recommend a particular treatment for you. The choice of treatment will be based upon giving the best clearance of the skin cancer while still maintaining the best cosmetic appearance. 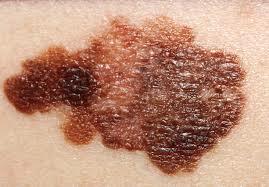 Melanoma is perhaps the most widely known skin cancer in Australia. It occurs very commonly in our climate with as many as 1 in 26 Australian’s suffering from melanoma throughout their lives. Melanoma is a skin cancer that is caused by exposure to the sun and UV radiation. People with fairer skin are more likely to contract melanoma but it can occur in anybody. 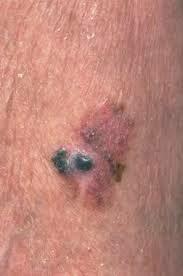 Melanoma usually presents as a dark spot or changing mole but can occur without the usual dark coloration. Melanoma can progress rapidly and can travel throughout the body so it is essential that it is picked up early and treated promptly. The earlier a melanoma is detected and treated the better the outcomes. Treatment for melanoma is surgical excision. This usually occurs in 2 stages. The first is a procedure known as an excisional biopsy, where the dark lesion is removed and sent to the laboratory for analysis. Based on the results from this analysis the second surgery is planned. The second surgery removes a wider area of tissue around the original tumor site to ensure that any microscopic extensions of the tumor are removed and may involve sampling the lymph nodes (sentinel node biopsy) to see if the melanoma is trying to spread. The amount of tissue that needs to be removed and the need for lymph node biopsy are determined by the results given from the laboratory analysis of the tissue collected at the first operation. In most cases of melanoma the surgical intervention is all the treatment that is needed. In some advanced cases you may also require other therapy in addition to your surgery. This may mean radiotherapy or chemotherapy. The need for these therapies is rare and if required will be discussed with you at your consultation with your surgeon.